We’d love your help. Let us know what’s wrong with this preview of Up Jim River by Michael Flynn. Hugo Award finalist and Robert A. Heinlein Award-winning SF writer Michael Flynn returns to space opera with Up Jim River. There is a river on Dangchao Waypoint, a small world out beyond Die Bold. It is a longish river as such things go, with a multitude of bayous and rapids and waterfalls, and it runs through many a strange and hostile country. Going up it, you can lose e Hugo Award finalist and Robert A. Heinlein Award-winning SF writer Michael Flynn returns to space opera with Up Jim River. There is a river on Dangchao Waypoint, a small world out beyond Die Bold. It is a longish river as such things go, with a multitude of bayous and rapids and waterfalls, and it runs through many a strange and hostile country. Going up it, you can lose everything. Going up it, you can find anything. The Hound Bridget ban has vanished and her employer, the Kennel (the mysterious superspy agency of the League) has given up the search. But her daughter, the harper Mearana, has not. She enlists the scarred man, Donovan, to aid her in her search. With the reluctant assent and financial aid of the Kennel, they set forth. Bridget ban was following hints of an artifact that would “protect the League from the Confederacy for aye.” Mearana is eager to follow that trail, but Donovan is reluctant, because whatever is at the end of it made a Hound disappear. What it would do to a harper and a drunk is far too easy to imagine. To ask other readers questions about Up Jim River, please sign up. Not that you'll be seeing all that much of the missing Bridget, but you will see a lot of her daughter who's searching for her. Even the H The novel begins and ends with the Hound and a question. Still, as such novels go, whether they're adventures or Space-Operas or many-vista'd hues of gorgeous untamed planets, they're full of stories and stories within stories. I see that in my review of The January Dancer (TJD) I neglected to mention the frame upon which Michael Flynn hung his story, which is related by “the scarred man” to the harper Méarana of Dangchao Waypoint as they drink uiscebaugh in the Bar on Jehovah. Up Jim River picks up right after the scarred man has finished his tale. I’m not spoiling anything by revealing that he is the Fudir or that Méarana (née Lucia Thompson) is the daughter of Bridget ban (née Francine Thompson), the Hound who accom I see that in my review of The January Dancer (TJD) I neglected to mention the frame upon which Michael Flynn hung his story, which is related by “the scarred man” to the harper Méarana of Dangchao Waypoint as they drink uiscebaugh in the Bar on Jehovah. Up Jim River picks up right after the scarred man has finished his tale. I’m not spoiling anything by revealing that he is the Fudir or that Méarana (née Lucia Thompson) is the daughter of Bridget ban (née Francine Thompson), the Hound who accompanied the Fudir, Little Hugh and Greystroke in the previous novel. After the events of TJD, the Fudir – who began life in the Periphery as Donovan, an agent of the Confederation – is taken by Those of Name and interrogated. The questioning shatters his mind into 7+ personalities & for the last twenty years he (they) have been hiding in Jehovah’s Terran ghetto (The Corner). Méarana has come seeking the scarred man to enlist him in her quest to find her mother. Bridget ban has disappeared into the Wild, the uncharted spaces beyond the boundaries of the Periphery, reportedly seeking a Commonwealth artifact that could tip the balance between the United League of the Periphery and the despotic Confederation that rules Earth. Bridget ban’s fellow Hounds have given up the search. Thus, TJD was prolog to the real story that begins when Méarana and the scarred man set out to follow her mother’s trail. Up Jim River is nearly as good as TJD but there are some particulars that prevent it from quite measuring up to its predecessor. First, there is the common disadvantage in a trilogy of being the middle novel – you start out in the middle of a story and you tend to end in the middle. In this case, the problem is minimal. Flynn tells a self-contained, fairly traditional quest story, and the only real disappointment is that we have yet to directly confront Those of Name. The second problem is more substantive. Unlike TJD, I didn’t find any of the new companions Méarana and the scarred man pick up very interesting. The band that set out to find the January Dancer was more vivid and their backgrounds more involving, and so their fates more interesting (outside of the Fudir’s and Méarana’s in this novel). The third problem I had with achieving unalloyed pleasure with Up Jim River was the pacing. For the first 6/7’s of the novel, the pace is rather desultory but in the last 50 pages, it revs up to Warp 10, and we careen up a river and into orbit, where the protagonists finally discover what happened to Bridget ban. The ending didn’t disappoint but I wish I could have savored it more. In truth, I enjoyed Flynn’s leisurely jaunt through the Periphery and the Wild because he was having so much fun exploring his universe and dealing with the theme of fact becoming legend becoming myth. For in this book we get a greater understanding of just how deep his future history is. In TJD, it was unclear (at least to me) how distant the fall of the Commonwealth was – a few centuries?, a millennium? It was actually nearly 10,000 years before the story begins, and Flynn takes great delight in showcasing the variety of ways humanity’s colonies have developed. There’s Rickety Thistlewaite, a stop along the Silk Road. There Brythoni and Zhõgwo have mixed to create a planet where the Emperor of Morning Dew sheen – Resilient Services (né Johnny Barcelona) – takes High Tea and personally serves scones and jam to his guests, and the cities carry names like “Tsienchester.” Or there’s the condition of the Terrans who were forcibly transported by the Confederation when it “cleansed” Old Earth. In the subsequent millennia, they’ve achieved a status similar to the ghettoized Jews of Eastern Europe before WW2 –confined to special districts and generally despised by the populations among whom they live. 4.5 stars. Right off the bat, I need to say that I intend to re-read both this book and The January Dancer at which time, it is possible that both books will make it onto my 6 star list. Michael Flynn's writing is fantastic and the universe he has created is as interesting and original as any I have read about in the last few years. As good as the universe is, the characters are even better, with the "multi personalitied" Donovan being my clear favorite. In fact, there is so much going on and so 4.5 stars. Right off the bat, I need to say that I intend to re-read both this book and The January Dancer at which time, it is possible that both books will make it onto my 6 star list. Michael Flynn's writing is fantastic and the universe he has created is as interesting and original as any I have read about in the last few years. As good as the universe is, the characters are even better, with the "multi personalitied" Donovan being my clear favorite. Flynn's Spiral Arm series takes place in the post-Solar human part of the Milky Way galaxy. Humanity has been seeded to numerous worlds beyond Earth which was abandoned in the distant past because of some unknown conflict in the remembered only from myths and legends and religion. We met the main characters in book 1 The January Dancer, an average space opera, IMO. Book 2 goes a long way into fleshing out these characters and expanding our knowledge of Flynn's universe. It is a combination of my Flynn's Spiral Arm series takes place in the post-Solar human part of the Milky Way galaxy. Humanity has been seeded to numerous worlds beyond Earth which was abandoned in the distant past because of some unknown conflict in the remembered only from myths and legends and religion. We met the main characters in book 1 The January Dancer, an average space opera, IMO. Book 2 goes a long way into fleshing out these characters and expanding our knowledge of Flynn's universe. It is a combination of mystery and space adventure with the group encountering a multitude of planets and cultures and widely varying levels of development. 3 1/2 stars. I suppose I should hold judgment until I read the 1st part of the series, but it took me a long time to get into the story of this one. Lots of cool details and semi-interesting ideas along the way, but the main thrust of the plot was sort of uninteresting, at least until the end. The major plot twists were pretty easy to see coming, but I didn't really mind. Still, it's a genre I have a real weakness for, and it was a pretty good example. Not as good as The January Dancer, but it picked up considerably in the last fifty or sixty pages. Otherwise, it felt unfocused and sometimes hard to follow. Still, Michael Flynn's exuberance in creating the mish-mash languages and customs of the far future are entertaining and I will, at some point, continue with the tetralogy. Not a perfect book, by any means. Not as good as its predecessor. Too much time spent on setting up each new planet, all of which seem to basically have a two-dimensional quirk. Early going, I found progress very slow. But it does build momentum as it goes, and at the end I was quickly flipping pages to find out what happened next. I thought early on that I might be done with this series, but now I feel like I want to see what happens next. So in the end, a good book. And kudos to Flynn for nami Not a perfect book, by any means. Not as good as its predecessor. Too much time spent on setting up each new planet, all of which seem to basically have a two-dimensional quirk. Early going, I found progress very slow. But it does build momentum as it goes, and at the end I was quickly flipping pages to find out what happened next. I thought early on that I might be done with this series, but now I feel like I want to see what happens next. So in the end, a good book. First Line: This is her song, but she will not sing it, and so that task must fall to lesser lips. Up Jim River is the sequel to Flynn’s 2008 novel The January Dancer (review), picking up almost immediately at where the first novel left off. Where The January Dancer was written as a story being told, sort of an extended flashback with brief interludes in the here and now, Up Jim River takes place entirely in the present. If you haven’t read The January Dancer you really ought to stop now and go a First Line: This is her song, but she will not sing it, and so that task must fall to lesser lips. Up Jim River is the sequel to Flynn’s 2008 novel The January Dancer (review), picking up almost immediately at where the first novel left off. Where The January Dancer was written as a story being told, sort of an extended flashback with brief interludes in the here and now, Up Jim River takes place entirely in the present. If you haven’t read The January Dancer you really ought to stop now and go ahead and do that. These are two books that are part of one story and reading one without first reading the other will not only deprive you of essential information but deny you the chance to experience Flynn’s masterful use of language from the start. Like The January Dancer before it Up Jim River uses a very poetic style that is more reminiscent of a fantasy novel rather than a futuristic space adventure. However where The January Dancer’s narrative style occasionally bogged down the plot Up Jim River maintains a laser focus on the here and now telling a tighter story, with deeper characterization, and without sacrificing any of the linguistic wonder that Flynn so easily captures. In Up Jim River Mearana the Harper, daughter of the Hound known as Bridget Ban convinces the Scarred Man, sometimes known as Donovan sometimes known as the Fudir, to help her to track down her now missing mother. What ensues is equal parts mystery and adventure with a quest structure reminiscent of classic epic fantasy. This story really belongs heart and soul to the Scarred Man and the quest, while Mearana’s in name and intent, is as much about the Scarred Man’s own internal journey then it is about finding Bridget Ban. As we learned in The January Dancer the Scarred Man known as Donovan has had his personality split into at least seven distinct personalities each in charge of various parts of his mind and body. There is the paranoid and careful Inner Child, the deducting and observant Sleuth, the aggressive Brute, the manipulative Silky Voice, and dry and intellectual Pedant, and the more fully formed personalities of Donovan and the Fudir. In Up Jim River some of the most potent writing comes from Donovan’s lengthy conversations with himself (each personality is given its own font type) and the indecision and physical manifestations of his inner struggle really drive home the broken nature of the man. Late in the novel, when Donovon is finally forced to confront his own brokenness and his various selves face-to-face unveils one of the most complicated and most stirring sections of the novel. Something subterranean rumbled with gigantic laughter, sending Inner Child scurrying in flight, silencing even the silent Donovan (for there is a silence more deep than mere quiet). Each of him regarded himself to the extent that things unreal can regard anything. A fragment of an ancient poem brushed his mind too lightly for the words to alight; and a terrible foreboding took hold of him. An image of a shadow, slouching, at a distance, like a stranger seen under a lamppost under a foggy night. Dead, he thought; or part of him though. All tears are dust. The language isn’t quite flowery but there is a certain cadence, a rhythm, to it that lends it a near mythic quality. In the passage above is the obvious, though obscured, reference to to Yeats; Second Coming and it is these half-remember, or incorrectly remembered bits of our own past that enhance that same sense of myth. Whether it be the great “sky gods” which count both Einstein and Planck amongst there number, the mysterious “mighty condrians” , or the wonder and mystery of “True Coriander” Flynn truly does an amazing job of scattering bits of our present and past across the universe creating an odd pastiche and strange amalgamations that are both familiar and wholly strange. While the first two thirds of the novel are a planet hopping mystery adventure the final third most closely resembles a quest narrative as our now fully formed party of adventures takes a great journey into the wilderness in search of secrets from the now ancient past. There are even talking swords! Flynn’s ability to turn science fiction on its head, to give it the sound and feel of fantasy or myth is difficult to describe without experiencing it for yourself. Several reviews of Flynn’s work have compared him to Tolkein which is an apt one as he displays a similar ability to weave our own past and present into a mythology and world wholly his own. If you are looking for something a bit different then I highly highly recommend you give Michael Flynn a try for some truly wondrous reading. Also, on a last note, I must say I’m a bit tired of cliffhangers! Hurry up with that next book Flynn because I really want to know what happens next! Got this because I have enjoyed a lot of Flynn’s other work, but I bounced hard off it and gave up after 70 pages. Discovered only afterwards that it is the second in a series; maybe I would have done better to start at the beginning. This one is a direct sequel of the superb The January Dancer - it starts 20 years after the main events there, but immediately after the interludes that tell those events. We reconnect with the main characters from the novel, but here the tale is simpler - Lucia the 19 year old daughter of "Hound" Bridget-ban (aka super agent for the League, one of the main powers of the novels and the "good guys") is looking for her disappeared mother; of the three men who were with Bridget on the January Dance This one is a direct sequel of the superb The January Dancer - it starts 20 years after the main events there, but immediately after the interludes that tell those events. Donovan who seemingly ran on his 3 companions (Bridget, Hugh and Greystroke), was in reality broken by his former masters, "Those of Names" who lead the Confederation, the other major power of the series aka "the bad guys" and now is a useless drunk with 7 personalities (dominant being Fudir and Donovan) warring in his head. Of course Mearana "convinces" Donovan to help her at least for a while and well, you know how the story runs from here though there are some twists and turns but many are telegraphed. In a way Up Jim River is a very "travelogue" novel, following Bridget's path and exploring the League's part of the humanity and its boundaries in a sort of Vancian way of the Gaean later novels. And here is the main weakness of the novel in that the attempt to create weird cultures a la Vance falls flat because it conflicts with the Celtic flavored archaic language of the novel and the result is partly messy, partly silly and very rarely convincing, while descending into farce on occasion; and then there are the silly mannerisms, way overdone of Donovan's acquired servant Billy (luckily The Fudir's mannerisms in Dancer were much less annoying) so Up Jim River is not quite there where I expected it to be. 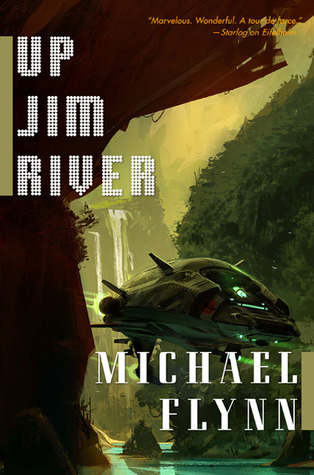 Up Jim River is the second book in Michael Flynn's Spiral Arm series. It picks up after the events of The January Dancer with Mearana (the Harper) and Donovan (the Scarred Man) as they set out to find Mearana's mother. Her mother is none other than "Hound" Bridget-Ban, the super-agent who played a major role in The January Dancer. It seems that Bridget-Ban has gone missing for about two years. Her organization, the Kennel, which is the intelligence arm of the League, has given up the search for Up Jim River is the second book in Michael Flynn's Spiral Arm series. It picks up after the events of The January Dancer with Mearana (the Harper) and Donovan (the Scarred Man) as they set out to find Mearana's mother. Her mother is none other than "Hound" Bridget-Ban, the super-agent who played a major role in The January Dancer. It seems that Bridget-Ban has gone missing for about two years. Her organization, the Kennel, which is the intelligence arm of the League, has given up the search for her. Or have they? Donovan (view spoiler)[who saved the day at the end of The January Dancer subsequently (hide spoiler)] was broken by his former masters, "Those of Name" who control the Confederation, the other major power of the series. (The Confederation are opposed to the League, and seem to be the bad guys in the series.) As a result of the mistreatment he endured, Donovan has become a scarred and seemingly useless drunk with 7 personalities warring in his head. Mearana and Donovan travel from planet to planet into the "wild" tracing clues to her mother's fate. As they get deeper into the raw frontier, things get dangerous. Along the way they have multiple adventures, and they are joined by others, who provide skills or knowledge necessary for the journey. However, these fellow travelers have their own agendas and, some may not be trustworthy. Flynn is a very skillful writer. He deftly weaves some tropes more common to fantasy into this story without it being incongruous in any way. I had a few laugh out loud moments. Spoilers ahead for The January Dancer. The harper is going to look for her mother, because the Kennel has given up. Donovan, knowing something of what it would take to keep Bridget ban away and make the Kennel gives up, agrees to go with her to High Tara, to get the Hounds to talk her out of it. What happens is that the harper's goodfather, as they put it, her honorary uncle, makes some threats about what will happen to Donovan if she is injured or killed on her quest. And so they are off, tracking Bridget's known itinerary after she left -- telling her daughter she would be back soon -- in hopes that her daughter would pick up clues that the Hounds would miss. Not to mention, as it turns out, clues that Donovan would pick up. And we learn more about the end results of what happened to Donovan after the action of The January Dancer. Plus a few hints of what actually happened -- not many. They track through exotic worlds -- visit jewelers, see a lynch mob, travel third class, present a bribe on the pretense of asking the official for an opinion of the engraving, meet a ship captain who remembers Donovan, have the harper play for an emperor who would rather build bridges, track Bridget by a pseudonym only three people know, and otherwise see adventure. They also continue their talk about quests and other matters of life and death. And there is an amazing amount of detail that you can track back to the old Terra of nowadays -- or earlier. Up Jim River continues telling of a future universe Flynn first chronicled in The January Dancer. (If you haven't read The January Dancer, do so---you will not regret it.) In this far future, much of our present world and point of view has been forgotten, swallowed by vast time and space. Flynn's characters play in an heroic Space Opera dominated by the League, a quasi-governmental group whose will is done by the Kennel, whose agents(Hounds and their Pups)are resourceful, relentless, clever, mani Up Jim River continues telling of a future universe Flynn first chronicled in The January Dancer. (If you haven't read The January Dancer, do so---you will not regret it.) In this far future, much of our present world and point of view has been forgotten, swallowed by vast time and space. Flynn's characters play in an heroic Space Opera dominated by the League, a quasi-governmental group whose will is done by the Kennel, whose agents(Hounds and their Pups)are resourceful, relentless, clever, manipulative super-spies; and the Confederacy, ruled by Those of Name, an enigmatic opposition group both ruthless and frightening. Bridget ban, a Hound, has gone missing and is being sought by her daughter Mearana, a Harper of some distinction. She enlists the unwilling help of the Scarred Man, whose personality has been shattered by mental torture under Those of Name. They and their varied and fascinating henchmen travel the star roads until they reach Dangchao Waypoint, a planet where there is a long and braided river. They are told, "If you go upriver you can find anything or lose everything." This proves to be true on many levels. I finished Michael Flynn's Up Jim River a couple of days ago, and it was quite good. This is the sequel to The January Dancer, and it picks up pretty much right where that left off. Donovan/Fudir is handled deftly in this volume - most of the internal voices each have their own font, and that's tremendously helpful. I found that the book steadily picked up speed as it progressed - it became less of a an exercise in sifting through history and more of a romp. I find the whole notion of the Hounds I finished Michael Flynn's Up Jim River a couple of days ago, and it was quite good. This is the sequel to The January Dancer, and it picks up pretty much right where that left off. Donovan/Fudir is handled deftly in this volume - most of the internal voices each have their own font, and that's tremendously helpful. I found that the book steadily picked up speed as it progressed - it became less of a an exercise in sifting through history and more of a romp. I find the whole notion of the Hounds and their Pups to be fascinating - it's like the the Birds of Prey were hired to be InterPol. A couple of tidbits: the search for the "true coriander" symbolizes the heights of technology and culture in the prior civilization which had fallen and which are only understood in fragments. I can only imagine what Medieval Europeans thought when they encountered some of the fallen Roman ruins, but I do know that the mysteries of the Ahu on Easter Island and the construction technologies of the pyramids were solved in my lifetime: I distinctly remember when wild speculation about the origins of these artifacts was a staple of hucksterism. I really do enjoy Michael Flynn's style of writing. He has the ability to put you into the conversations of the characters. His descriptions of the worlds you visit make you think you are looking out the portal of the ship. The characters are alive and real; flawed yet they reach a level of nobility. It seems a rare thing in trilogies to like the second better than the first , but it is the case here . In January Dancer we are introduced to a complex system of worlds in the far future, there is intrigue, action and a satisfying story. We pick up in Up Jim River several years down the road. The world stage has changed very little, but our characters have grown older. And there have been some interesting personal developments. A hopeless quest ensues with hopeless participants. We travel through many of the known (and some of the lesser known) worlds of the Spiral Arm ( the name given to the section of the universe which is connected by a sort of space highway that allows faster than light speed travel). You have to read this book if for no other reason than to get to know the scared man. He is one of the most interesting characters I have read in the science fiction genre. There is no way to describe him without spoiling it. You can read this book without having to read the next one but you'll want to. Up Jim River is the second book in the January Dancer series. I liked The January Dancer, but I liked Up Jim River even more, probably because by now I’ve gotten a handle on who everybody is and the plot presentation is much more traditional than the first book. The author continues to impress me with his elegant use of language and imagery. THE PLOT: Basically it’s about a young woman looking for her missing mother. As we learned in the first book, the Harper is the daughter of super-cop Bridg Up Jim River is the second book in the January Dancer series. I liked The January Dancer, but I liked Up Jim River even more, probably because by now I’ve gotten a handle on who everybody is and the plot presentation is much more traditional than the first book. The author continues to impress me with his elegant use of language and imagery. THE PLOT: Basically it’s about a young woman looking for her missing mother. As we learned in the first book, the Harper is the daughter of super-cop Bridget ban, who has gone missing. She enlists the help of the Scarred Man (Donovan/Fudir) who she suspects is her father, to help her. Their search takes them on a grand tour of the January Dancer universe, visiting many planets and learning more about their various cultural adaptations. Of course there are those looking to keep the Harper from finding her mother, and those who want to find Bridget ban for their own reasons—what kind of adventure would it be if there weren’t? The quest is successful, and after Donovan sees to it that his daughter and former lover are safe and sound he returns to the bar where the Harper first found him to take up his life of drunken oblivion once more. Then he gets kidnapped by an agent of the government he used to spy for. I didn't realize this book was a sequel until I came across references to the January Dancer in the text of this book. Then I remembered seeing that title on Flynn's Amazon page. D'oh! Oh well. I debated stopping Up Jim River and reading January Dancer first, but by then, the story was moving right along and I didn't want to quit. Flynn is quite the storyteller. I was fully involved in the search for the Harper's mother, even though I didn't care all that much whether or not they found her. I'd I didn't realize this book was a sequel until I came across references to the January Dancer in the text of this book. Then I remembered seeing that title on Flynn's Amazon page. D'oh! Oh well. I debated stopping Up Jim River and reading January Dancer first, but by then, the story was moving right along and I didn't want to quit. Flynn is quite the storyteller. I was fully involved in the search for the Harper's mother, even though I didn't care all that much whether or not they found her. I'd never met her, not having read the first book, and the way people talked about her, I wasn't sure I'd like her anyway. What kept me reading was Donovan/Fudir and his various personalities. They were fascinating. Also fascinating were all the places visited in the search, and it was great fun to try and work out the language. I'm left with some questions though. The big one being who were the "prehumans" they talked about. Are they the original inhabitants of the worlds settled by the Commonwealth? Alien or human? I also didn't understand the importance of the DNA "mighty chondrian" search. What does it matter, which worlds were settled first? I've bought January Dancer -- maybe my questions will be answered there. "Up Jim River" is a sequel to "The January Dancer" and there are two more installments in the Spiral Arm series. I'm still having trouble trying to grasp to the story. The story is long and tedious. It's not an easy book to read after you had a long day. In order to be fully immersed to the space opera, you need to read this book into different segments, where you need to take a breather in between the pages. It's not like running a marathon, where you can sprint to the finish. Flynn writes in d "Up Jim River" is a sequel to "The January Dancer" and there are two more installments in the Spiral Arm series. I'm still having trouble trying to grasp to the story. The story is long and tedious. It's not an easy book to read after you had a long day. In order to be fully immersed to the space opera, you need to read this book into different segments, where you need to take a breather in between the pages. It's not like running a marathon, where you can sprint to the finish. Flynn writes in depth of the storytelling, where I hit the wall many times and needed to be distracted. I will eventually finish this series, but there is no rush. I'm not really into space opera as I should be, but I really like science fiction. Flynn's direction for this series is somewhat tiring, but I also want to know how everything ends. I'm hoping for less storytelling and more plot and action. My review of Up Jim River would had been more favorable if I had read something different after The January Dancer. The series is still not there for me to look forward to "In the Lion's Mouth." I need to read something else before finding my devotion at finishing the series. “Up Jim River” is the second book of Flynn’s ‘Spiral Arm’ series. It takes place about 20 years after the first book ‘January Dancer’. You really need to have read the first book for this one to be readable. My review of the first book “ January Dancer” still applies. That is, that this series is only very superficially science fiction. It’s more of a purple prosed,‘sword-and-sorcery’ road-trip story, with the tech substituting for magic. In this story, the author does develop the protagonist ‘De “Up Jim River” is the second book of Flynn’s ‘Spiral Arm’ series. It takes place about 20 years after the first book ‘January Dancer’. You really need to have read the first book for this one to be readable. In this story, the author does develop the protagonist ‘Devon’, also ‘The Scarred Man’ who was the Fudir in the first book. The multiple aspects of personality are explored through this character, and are mildly interesting, but this addition does not make the book any better than its predecessor. I think I preferred January Dancer to this one, mainly because the harper was much more a main character in this book and I just never liked her. I figured out the twist in the relationships in the story early, as I think we're meant to, but the old friendships were what was most interesting to me. The story of tracking Bridget Ban ended up being more of a tour of worlds than a story in its own right, as well. The best part of the story dealt with the fractured personality of Donovan, another cha I think I preferred January Dancer to this one, mainly because the harper was much more a main character in this book and I just never liked her. I figured out the twist in the relationships in the story early, as I think we're meant to, but the old friendships were what was most interesting to me. The best part of the story dealt with the fractured personality of Donovan, another character that I didn't really care for in the first book. But the splitting of the personality into distinct parts was an interesting idea. The not-so United League of the Periphery, where the Hounds of the Ardry battle the chilling machinations of Those Of Name, and a kaleidoscope falling out of an (ahem!) Irish stew of cultures, has emerged as a captivating milieu for futuristic adventure, and we must hope for many more. This is a sequel to THE JANUARY DANCER, and clarifies what was actually going on there, while opening up more picaresque settings of the Periphery and the Wild. There are more enigmas which gnaw at the reader. How The not-so United League of the Periphery, where the Hounds of the Ardry battle the chilling machinations of Those Of Name, and a kaleidoscope falling out of an (ahem!) Irish stew of cultures, has emerged as a captivating milieu for futuristic adventure, and we must hope for many more. Not as much fun as the first one. This is admittedly a hazy sort of measure; briefly, I read through the first book in one sitting, and this one took many. For around half the book I wanted to scream at the characters that (view spoiler)[Billy was totally a spy (hide spoiler)]. I was confused by the chapter where (view spoiler)[Donovan gets drugged and left behind. It was like, whoa, they drugged him and took off, and then he recovered and he's commandeering some other ship to chase after them, bu Not as much fun as the first one. This is admittedly a hazy sort of measure; briefly, I read through the first book in one sitting, and this one took many. Almost as poetic as the first. Better storytelling then the first. A poetic space opera that holds you close with prosaic images and men with swords. While this is just me speaking, (Spoiler), i do find it intresting that they take thes story from the point of veiw of a space faring civilization that collapsed thousands of years ago, and formed these remnants of culture that became the modern spiral arm. Since i know several languages, i was able to pick up a decent amount of the mixed cultures, Almost as poetic as the first. Better storytelling then the first. A poetic space opera that holds you close with prosaic images and men with swords. As a sequel tthe January Dancer, a book I much enjoyed, I must say I liked this one more since it was more focused. You already have a basic outline of jthe universe involved and most of the characters. This time the Harper is off to find her missing mother who disappeared on a mission so across the universe they go seeking clues later involving something like an old African adventure. As always Flynn is a great writer okf dialog and solid plots. I expect another in the series as the ending left As a sequel tthe January Dancer, a book I much enjoyed, I must say I liked this one more since it was more focused. You already have a basic outline of jthe universe involved and most of the characters.